This season the Shaw Festival is staging only one play by its namesake author, the fewest it has offered since 1970 and a rather peculiar way for Jackie Maxwell to say farewell to her position as Artistic Director of the Festival. This one play is Mrs. Warren’s Profession, written in 1893 though it did not receive a complete public performance until 1925. The reason for the delay was that Mrs. Warren’s profession happens to be the “world’s oldest” and the play’s defence of it caused the Lord Chamberlain to ban it. The play’s examination of society’s hypocritical stance on prostitution and on the job opportunities open to women is still amazingly relevant. One may have doubts about the frame that director Eda Holmes gives the play, but her direction and the acting of the cast are of the highest order. When you enter the Royal George Theatre you are immediately impressed by the luxurious wood-panelled set by Patrick Clark that occupies the stage looking like the smoking room of a wealthy country house. 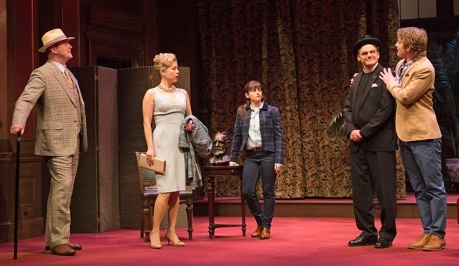 At first you think that Holmes must have set the play in its original period until actor Shawn Wright walks out in a modern suit and begins fiddling with his smartphone. The first performance of Mrs. Warren’s Profession was given on January 5, 1902, by the Stage Society at the New Lyric Club, a members-only men’s club that as a private club was exempt from the Lord Chamberlain’s ruling. Holmes’s notion is that to honour the 114th anniversary of the performance of Shaw’s play at the club, the club is staging it again. Nothing is wrong with this idea except that Holmes decides to make the present members of the (now non-existent) New Lyric Club less enlightened than were the original members who allowed such a pro-feminist play to be staged there. In added dialogue Holmes has the men on stage speak in patronizing terms about the “ladies” in the audience and the rules stating that that they must be accompanied by a member (i.e. a man) at all times in public places. (Having been a guest at a women-only club in Toronto, I can state that its rules were just the same only with the sexes reversed, so making fun of these rules does not deserve the sneering manner in which Holmes presents them.) The problem is that portraying the New Lyric Club as a malevolent den of male chauvinism leads one to think that the Club’s production will present Shaw’s play in some sort of skewed fashion. Fortunately, that does not happen. There was a women-only club in London that began in 1887, but the Stage Society chose a men’s club for its venue. Why, then, disrespect the original club or its new incarnation for its open-mindedness in bucking British censorship? Once the frame is dispensed with, the play is just as well performed and directed as it was on its last appearance at the Festival in 2008 under Jackie Maxwell. For those who don’t know the play, the story is centred on 22-year-old Vivie Warren (Jennifer Dzialoszynski), who has graduated from Cambridge emancipated and self-sufficient. She is eminently practical, mathematically inclined and bored by the arts – thus the very opposite of a clichéd Victorian woman. Currently Vivie is happily living in the country and preparing for a job as an actuary in London. Having grown up entirely in boarding schools she has hardly ever seen her mother and does not even know who her father is. Being liberated has not scared off admirers. Frank Gardner (Wade Bogert-O’Brien), the son of the neighbouring vicar (Shawn Wright), would like to marry Vivie but he has nothing to offer and has no knack or even desire to make money. Disrupting Vivie’s peace is the arrival of Mrs. Kitty Warren (Nicole Underhay), whom Vivie disdains as an uncaring mother because of her nearly constant absence. Mrs. Warren has has done everything money can buy to give her daughter an education and the opportunities that she never had, but she has deliberately concealed the source of her income. To win Vivie over to her, Mrs. Warren feels she must finally reveal her past which she does in a long confession in Act 2. Vivie is liberated enough that she can forgive her mother because Vivie is aware enough of the unequal status of men and women to know that prostitution is sometimes the only way for women to earn a living, especially when the alternative for a poor female worker is to die of white lead poisoning as did Mrs. Warren’s sister. Mrs. Warren, however, has left Vivie with the impression that she is no longer in the business. When her slimy aristocratic business partner Sir George Crofts (Thom Marriott) proposes marriage to Vivie and is rebuffed, he decides to hurt her by telling her the full story. 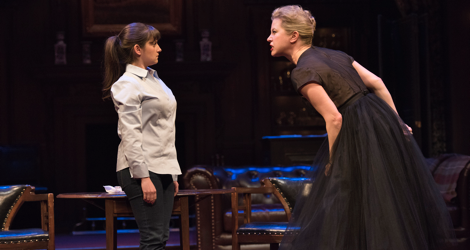 This leads to the epic row between mother and daughter that closes the play. In Jackie Maxwell’s production of 2008, the play seemed equally balanced between the arguments of Vivie and her mother. Mrs. Warren was a low-born woman who went into the business of vice as the only way to make money and used that money for the benefit of her daughter. She deliberately excluded Vivie from her life so that Vivie would not be tainted by it. Mrs. Warren’s return was a desperate plea to rebuild a bond between her and her daughter now that Vivie was old enough to understand what happened. Under Maxwell the story became Mrs. Warren’s tragedy at being rejected by a daughter who could not appreciate her mother’s sacrifice. In Eda Holmes’s production we are solidly on Vivie’s side from start to finish and mostly wonder whether she will be strong enough to be able to withstand the onslaught of Frank, her mother and Crofts. We do understand that Vivie can no longer accept money from her mother now that she knows its origin, but we also wonder whether Vivie is being overly harsh in cutting off all ties with her mother forever. To persuade us that Vivie is right in rejecting Mrs. Warren, Holmes emphasizes that not just Mrs. Warren’s money but her life itself has become tainted. When Frank begins flirting with Mrs. Warren, Shaw’s stage directions say, “At last she kisses him, and immediately turns away, out of patience with herself”. That is not how Holmes directs it. Mrs. Warren gives Frank a long, lingering kiss that is certainly not the “motherly kiss” she claims it is. It’s a lapse that causes us to question the morals of both her and Frank. Besides this, Mrs. Warren’s business partner is not merely slimy but brutish, which makes us wonder why she keeps such nasty company. energy to assert her self in the face of the rest of the world. It is an immensely vital performance that makes all the men surrounding Vivie look languid by comparison. Dzialoszynski makes Vivie so assertive that no one, not even her mother has much of a chance in dissuading her from whatever she has decided. 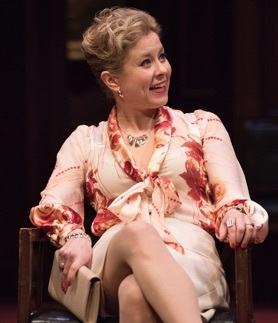 Nicole Underhay gives a great performance as Mrs. Warren. Her Mrs. Warren may sport a lower-class accent but she is so vivacious and stylish that it is no wonder she has been so successful. Underhay delivers Mrs. Warren’s long narrative on how she came to be in the business with such authentic emotion it seems exactly right that this should be the one time that Vivie lets down her guard to sympathizes with her. Underhay’s performance of Mrs. Warren’s final showdown with Vivie is beautifully gradated as the mother alternates between arguing and pleading to have Vivie accept her until, seeing no success in sight, she turns icy and vicious. As Frank Gardner, Wade Bogert-O’Brien adds to his catalogue of ardent young men, but to this one he gives a distinctly unsavoury edge. In playing brother and sister with Vivie, Bogert-O’Brien’s Frank comes off as the fantasist while Vivie remains the realist. He makes Frank’s flirtation with Mrs. Warren fairly shocking as if, in reality, he found the mother’s dubious ways more to his liking that the unbending righteousness of her daughter. Thom Marriott’s supercilious facial expression and pompous bearing immediately announce Sir George Crofts as the most unlikeable character in the play. Marriott gives Crofts the air of one who has never seen his insincere smile and mellifluous voice fail to win a woman over till now and when Vivie does not capitulate to his supposed charm, his anger reveals the truly ugly nature that lies beneath the surface. Gray Powell plays the architect Praed, friends with both Vivie and with her mother. Praed’s main function is to turn conversations toward the theme of art, only to be repeatedly knocked down. Powell is eminently effective in making Praed appear ineffectual and no match for Vivie’s Philistinism or Mrs. Warren’s love of money. Praed is a Cornish name and Powell seems, without much success, to be affecting a Cornish accent. Since the dialogue never mentions Praed’s background of accent, it would be best to drop it. Shawn Wright is very funny as the Reverend Samuel Gardner, who is not a man of the cloth by choice. Whereas Praed can at least wax eloquent about art, Gardner seems unable to stand up even for his profession. It’s no wonder that Frank has no respect for him, since Gardner seems to have more pleasure in recalling his wild youth than his present vocation. If Mrs. Warren’s Profession is the only play written by Shaw at the Shaw Festival this year, at least it is one of his most remarkable works. It was a play far ahead of its time in 1893 and in in many parts of the world its frank discussion of prostitution as the purest form of capitalism would still cause it to be banned. It is also a play whose debates are not easily resolved into right and wrong which makes it open to varying interpretations. If Maxwell shaped it into a type of tragedy, Holmes has shaped it as a comedy in which Vivie, difficult as it is for her, has to cut away all the ties that will hinder her vision of independence and self-reliance. One leaves the play thinking how lucky Canada is to be the only country in the world with a festival dedicated to celebrating Shaw’s works. Photo: (from top) Jennifer Dzialoszynski as Vivie and Nicole Underhay as Mrs. Warren; Thom Marriott as Sir George Crofts, Nicole Underhay as Mrs. Warren, Jennifer Dzialoszynski as Vivie, Shawn Wright as Reverend Samuel Gardner and Wade Bogert-O’Brien as Frank;Nicole Underhay as Mrs. Warren. ©2016 David Cooper.